15 1/4, 25 & 42" cylinders; 36" stroke; 800 hp @ 90 rpm; boilers: Marietta Boiler Works, Marietta, OH(1902); 11' x 10', 180# steam. 1916 Owned Bay Steamship Co., New York, NY. 1917 Owned Bay Steamship Co. Ltd., London, ENG; #140405; 211.5 x 40 x 13; 1293 gross tons. 1921 Owned French Government, Havre, France. 1921 Owned Interlake Navigation Co. Ltd., Montreal, QUE. 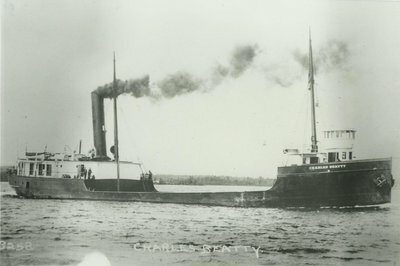 1923 Owned White, Grafwick & Mitchell Steamship Co., Buffalo, NY; US127641; 211 x 40 x 13; 1366 gross/912 net tons. 1924 Ton change 212.5 x 40.16 x 13.16; 1310 gross/745 net tons. 1926 Owned F.D. Gleason Coal Co., Detroit, MI. 1936 Owned Nicholson Transit Co., Detroit, MI. 1942 Owned U.S. War Shipping Administration, Washington, D.C.; 208.75 x 40.58 x 13.58; 1210 gross/597 net tons. 1946 Owned Nicholson Transit Co., Detroit, MI. 1951 Rebuilt & converted to diesel; 4 cycle; 208.75 x 40.58 x 13.58; 1176 gross/1005 net tons. 1951, Aug Ashore Lucille Island, Lake Superior; released in August. 1961 Owned Toth Transportation Co., Toledo, OH. 1967, Summer Sank at dock, Maumee River, Toledo, OH; raised spring 1968. 1968 Owned Lucas County State Bank, Toledo, OH. 1970 Owned Walter Kolbe, Port Clinton, OH. 1974 Owned Capital Dredge & Dock Corp., Lorain, OH.